An understated chassis, but what about the components? 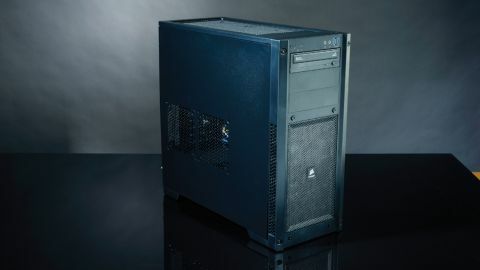 Housed within the simple, diminutive form of the Corsair Carbide 300R, you'd be forgiven for thinking this Dino PC build doesn't really look like a £1,000 PC. But this is a gaming machine - not something built to sit looking pretty on a stand at some Taiwanese trade show. To be honest, so long as it's not obstructive in any way, we're not very bothered what clothes our gaming PCs arrive in. Most of our machines sit beneath our desks, and once the game is loaded all our attention is on the screen. If you can save money on a chassis then you've got some more cash to play with and throw at the more important components sitting inside it. The parts list is looking pretty good once you get past the plain exterior. The now ubiquitous i5-3570K is once more in evidence, and an overclocked GTX 670 is sitting in the main PCIe slot, taking responsibility for making your games look and run beautifully. It also has a small Corsair SSD installed as an OS boot drive to prop up the standard 1TB mechanical hard disk. Sadly though, that ubiquitous CPU isn't given the same amount of overclocking lovin' it is elsewhere in our test, coming in at a relatively conservative 4.4GHz. Like the AdvanceTec and Cyberpower machines, that puts it at the bottom of the pile in terms of CPU performance. On the flip side though, the decision to opt for an overclocked GTX 670, like that found in the Chillblast machine, means that it yields impressive gaming benchmarks to offset that CPU performance. By using an overclocked GTX 670, it can hit frame rates rivalling the stock clocked GTX 680s that the Vibox and YOYOTech machines are packing. In gaming terms then, this bizarrely named Baronyx is a bit of a powerhouse. The margins in this crowded marketplace are tight though, and that weaker CPU performance drags the machine down as a whole compared to the competition. We also found it a little odd that despite opting for a small SSD it hasn't taken advantage of the Intel Smart Response technology to pair it up with the HDD. At 60GB, there isn't a huge amount of spare capacity for your games once the OS has been installed. Chances are you'll fit two titles on there before running low on space. That means your Steam library is relegated to the slower HDD, so you only really feel the benefit of the solid state drive for those 14 seconds of booting. Linking via Smart Response, you'd find your oft-loaded titles benefiting from the SSD caching and boot times wouldn't suffer - as demonstrated by the AdvanceTec ATFX-XPredator. Again, the Dino PC is by no means a bad rig; it performs brilliantly in terms of pure gaming, which is our raison d'être. But in terms of all round value and performance, it's left in the shade by some of the other excellent rigs in this test. Balance is vital at this price point, and with the Baronyx, the scales are just ever so slightly off-kilter.